The seven chakras are the spiritual control over our emotional body as well as having many other functions. Your foundation is in the body's central axis. The flow points of the chakras on the body provide simple and effective reflex areas ideal for rubbing with essential oils. Tanja has developed aromatic oil blends harmoniously coordinated especially for the exercises of Yoga. These seven compounds are contained in two products, "the 7 Chakra Oil Set" and the "7 Chakra Spray Set”. These seven most valuable compounds have been designed for gentle application on the chakras and aura. They can also be used for many other purposes, such as during an Aroma Yoga session- the imagination knows no bounds. Each chakra oil contains ingredients that unite in accordance with the vibration of each chakra, and each of the individual Chakra mixes includes a combination of about 10 essential oils with a golden jojoba oil base. Furthermore, each bottle is infused with sunlight and loving energy. The mixtures are enriched with various gemstones, flower essences and colors that harmonize with each of the special individual energy centers / chakras. These chakra oils applied to the respective corresponding chakra energy centers can help resolve certain blockages in the body and yield hidden information that is stored in the centers. Thus, a healing process in the body and the psyche can be enabled and supported. The oil mixtures act specifically on physical body while the Chakra Sprays work to clarify the aura. The oil combinations in both Products are the same, however instead of a Jojoba oil base, the chakra spray mixtures have a base of filtered and energized water, and are set as a natural emulsifier. You can use any sprays at a time, or dedicate yourself to another chakra every day. For optimum benefit and the correct use of products, we advise taking an Aroma Yoga workshop series. 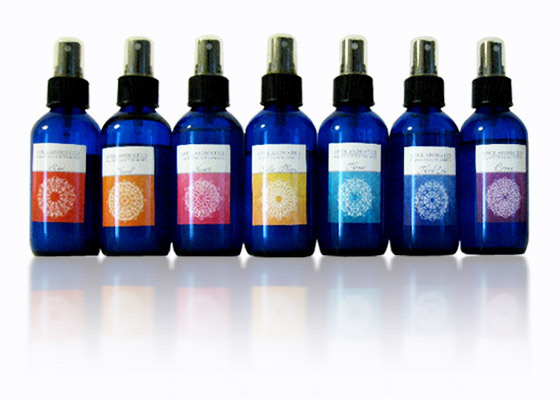 All Aroma Yoga products, as well as other natural products, can be found in our online shop.. Please visit our Online Shop to see more fantastic natural perfumery products.